With sales of many packaged goods soft or declining, a growing number of big brands are partnering with home meal-kit services or grocery retailers’ online divisions to turn an emerging competitor into an opportunity. 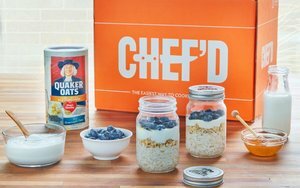 The latest is PepsiCo’s Quaker, which this month began offering three Quaker-branded “Overnight Oats” meals on the Chef’d online meal-kit marketplace. The meals, featuring Quaker’s Old Fashioned Oats, make Chef’d one of the only major meal-delivery services to offer breakfast, according to the companies. Chef’d is among an estimated 150 meal-kit ventures jockeying for a piece of what Piper Jaffrey has estimated is currently only about a $2 billion market in the U.S. Further, the market is heavily dominated by just three companies, according to a report from 1010data: Blue Apron, with an estimated 71% share, followed by Hello Fresh, and Plated, with 23% and 6%, respectively. But Piper Jaffrey projects that the meal-kit business will grow to $36 billion by 2024. And Chef’d founder and CEO Kyle Ransford recently told Upstart Business Journal that he expects his company (which currently sends out hundreds of thousands of meals per month, versus Blue Apron’s 8 million), to grow to 10 times its current size within a year. Ransford said that Chef’d is doubling its revenue and orders each quarter due to its partnership-focused business model. Chef’d partners with brands that have their own recipes and uses its operations to handle the sourcing, packing and delivery of the ingredients for them. It also benefits from the partners’ marketing capabilities. Those partners include media brands such as the Allrecipes site and social network, The New York Times, Men’s Health, Vegetarian Times and Good Housekeeping; and programs, clubs and organizations including Weight Watchers, Atkins and the American Diabetes Association; in addition to food brands including Hershey’s Kitchens (chocolate desserts), Scharffen Berger chocolates, P.F. Chang’s and Gen Korean BBQ House, as well as Quaker. Chef’d also has the advantage of having Fresh Direct — the online grocer that serves New York City and tri-state areas plus Philadelphia — as an investor and partner. Fresh Direct has helped Chef’d expand its supply chain and source ingredients, reports Upstart. Although recent NPD Group research found that just 3% of U.S. adults had tried meal-kit services in the past year, a Technomic survey found that more than half of those interested in trying the kits also believe that they’ll cut back on buying groceries at retail as a result. ConAgra Foods told The Wall Street Journalthat with CPG sales declining in the physical stores in the traditional grocery retailer channel (ConAgra’s own have been down in that channel for the past three years), it wants to try to head off meal kits’ potential to further cannibalize sales. So this past June, the company partnered with Peapod, the online business owned by giant grocery retailer Ahold, to sell meal kits featuring recipes that incorporate Hunt’s and other ConAgra brands. Campbell Soup Company has a similar partnership with Peapod for meal kits that call for using its soups and other products; and Tyson Foods recently teamed with Amazon Fresh to sell meal kits that feature its chicken and beef products, per WSJ. Many meal-kit startups fold quickly. Realizing a profit in any business that involves high-overhead, infrastructure-intensive home delivery is notoriously difficult. But ventures that can attract big food brands eager to sell through new channels would seem best positioned to dominate the business in the years ahead. ConAgra and Campbell seem to believe that extending their relationships with traditional grocery retailers through meal kits sold through those retailers’ own online businesses, like Peapod, is a natural and scalable option — and others may follow them. Multi-banner supermarket retailers like Ahold are investing heavily in expanding and honing their online businesses, and are generating higher average basket sizes that online-only grocery retailers including Amazon and Fresh Direct, according to just-released research from retail consultancy Brick Meets Click.